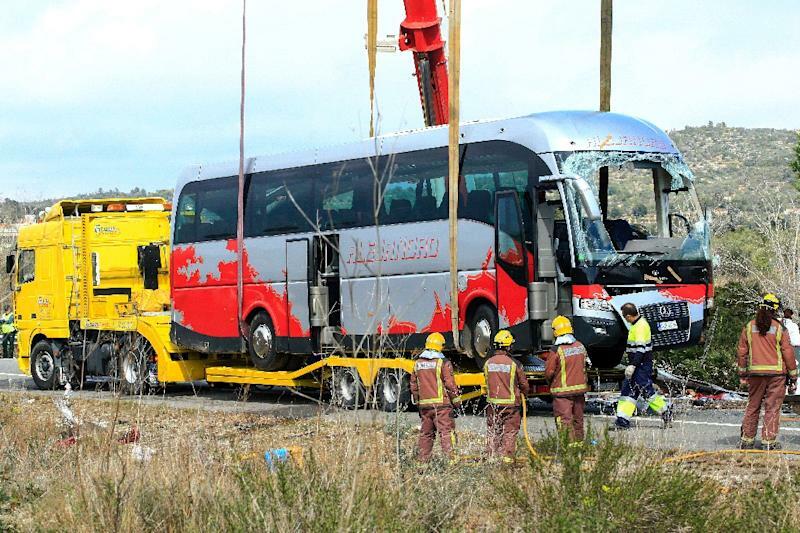 Tortosa (Spain) (AFP) - Spanish investigators were on Monday attempting to establish the cause of a weekend coach crash that killed 13 foreign students, all young women and most of them from Italy. The vehicle was carrying 57 passengers from about 20 countries, many of them students on the European Erasmus exchange programme in Barcelona, the seaside capital of Spain's northeastern Catalonia region, authorities there said. The driver lost control of the coach which crossed the central reservation and crashed into an oncoming car near the small Catalonian town of Freginals, about 150 kilometres (95 miles) south of Barcelona, just before 6:00 am (0500 GMT) on Sunday. Seven Italians and two Germans were among the dead along with another four passengers -- from Romania, Austria, France and Uzbekistan -- all of them women aged between 19 and 25. "Some of them were not wearing seat belts," Jordi Jane, who heads up interior matters for Catalonia, told reporters in the town of Tortosa, headquarters of the rescue operation. Thirty-four other passengers were injured in the crash, 24 of whom remained in hospital on Monday, six in serious or critical condition, Catalan officials said. Italian Prime Minister Matteo Renzi, wearing a black suit and tie, met with bereaved family members in Tortosa as well as with injured passengers at hospitals in the nearby city of Tarragona. He declined to speak to the media but on his Facebook page said he had come to bring the "support, affection and emotion that all Italians have felt" for the victims' families. "Why does this accident in Catalonia affect us so much? Maybe because when you think of these seven young women with their bright smiles, so full of life, it is hard to think of a coffin." Alessandro Saracino, the grief-stricken father of one the Italian victims, said it appeared that the driver "fell asleep". "Driving in the rain at four in the morning is not safe. I was relaxed when I sent my daughter to this friendly country and she is being returned to me dead," he told reporters on arrival in Catalonia. Investigators were looking into both human error and technical problems as possible causes, Jane said. According to the coach's tachograph -- the device which records the vehicle's speed and distance as well as the driver's activities -- the driver had taken the necessary rest period. "But the question is whether during this rest period, the driver had rested sufficiently," Jane said. The 62-year-old driver is in intensive care being treated for chest injuries, he added. The driver had been due to appear before a judge on Monday, but the hearing has been postponed, a legal source told AFP. On Sunday the driver had refused to speak to police on the advice of his lawyer, Jane said. He could face charges of 13 counts of involuntary manslaughter. The mayor of Fraginals, Jose Roncero Pallares, said the stretch of motorway where the crash occurred is known as an accident blackspot for reasons he didn't explain. "It rained a lot that night and maybe that played a role," he told AFP. 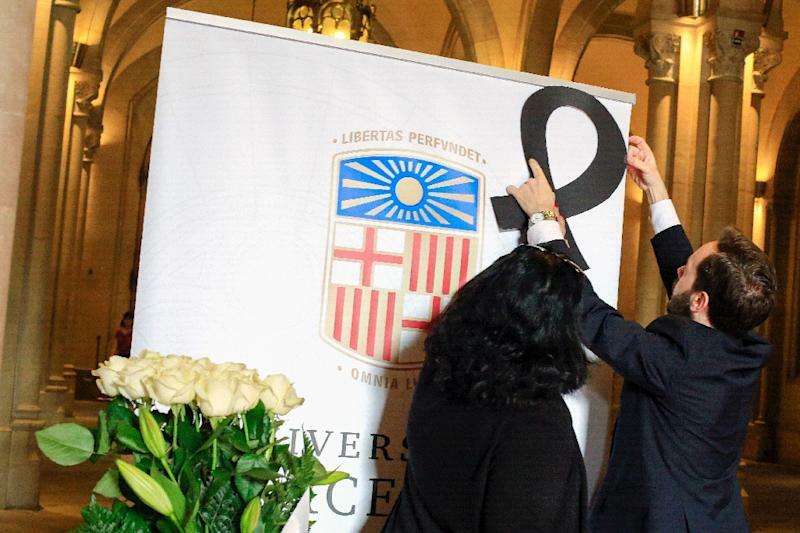 Dozens of people observed five minutes of silence outside one of the buildings on the sprawling campus of Barcelona University. "The entire city of Barcelona is crying," said mayor Ada Colau. A steady stream of mourners signed a condolence book at the university and left candles and flowers. 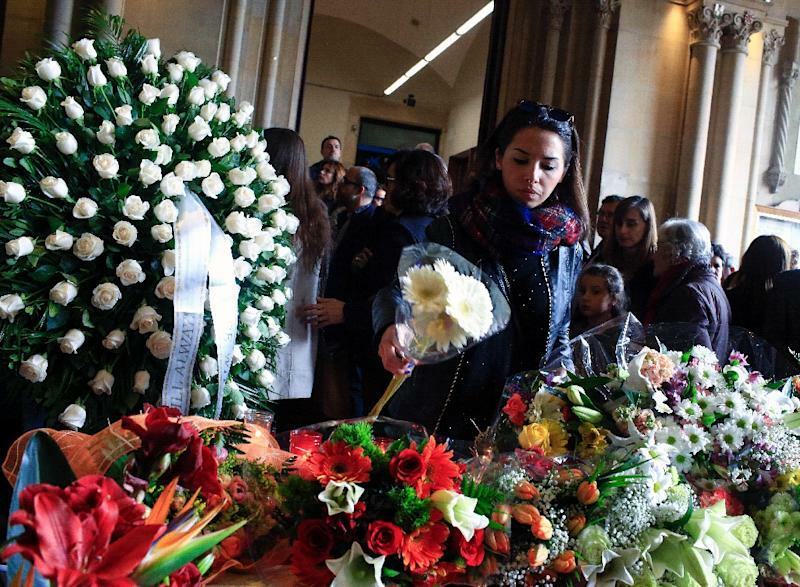 Luisa Fortes, 68, who studied at the university said she was "deeply moved" by the death of the 13 students. Some 1,500 students from across Spain, including around 275 from Barcelona University, had travelled to Valencia for the Las Fallas festival. Many of those on board the four other coaches reached their destination without even knowing about the accident -- one of the deadliest in Spain in recent years. In November 2014, a bus carrying pilgrims fell into a ravine in the southeast of the country, killing 14 and injuring another 41.